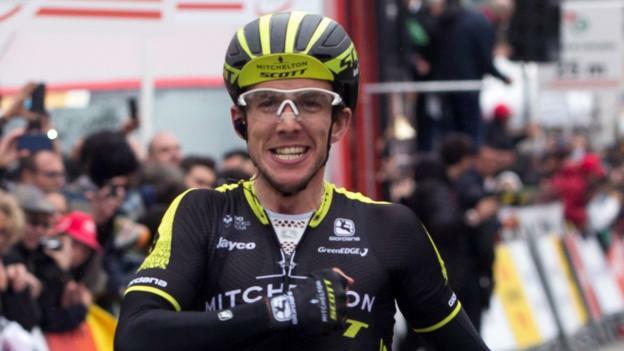 Britain’s Simon Yates is relishing the chance to lead his Michelton-Scott team’s bid to win the Giro d’Italia. Yates and Colombia’s Esteban Chaves head the Australian outfit’s eight-man squad for the first of the year’s three Grand Tours. The 101st edition of the race starts on Friday, 4 May in Jerusalem, Israel and features Team Sky’s Chris Froome looking for his first win in the race. “We’ve assembled one of the best teams we can for a Grand Tour,” said Yates. Yates, a strong rider in the mountains, has had an excellent start to the year with two stage wins and a second-place finish at the prestigious week-long Paris-Nice – he led going into the final stage but ended up losing the title by four seconds. He finished seventh on his Tour de France debut last year and was sixth at the Vuelta a Espana in 2016. Michelton-Scott sport director Matt White says while his team are not favourites for the Giro, they will still be aiming for success in the overall standings in the race which after Jerusalem will travel to Sicily and then the Italian mainland. In 2016, Chaves wore the leader’s pink jersey on stage 20 before finishing second overall – the team’s best result in a Grand Tour. “We are making no secret that our focus for the Giro d’Italia is on the general classification and Yates and Chaves are our leaders,” he says. Briton Froome won his fourth Tour de France title last year and followed that by winning the Vuelta a Espana. If he wins the Giro, the 32-year-old will become the third man to win three successive Grand Tours. Belgian Eddy Merckx won four on the trot in 1972-73, while France’s Bernard Hinault claimed three in 1982-83. BBC Sport will have live text commentary on all 21 stages of this year’s Giro.